Bindu Naik has done B Sc in Zoolgy, M Sc in Biotechnology, M Tech in Food Science & Technology with a Ph D in Bioprocess & Food Engineering. She is also NET qualified. She has worked at BFIT and Doon PG College as Assistant Professor. 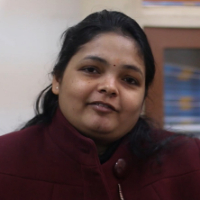 She joined Uttaranchal University in 2018 and has been working as an Assistant Professor here. "I have done B Sc in Zoolgy, M Sc in Biotechnology, M Tech in Food Science & Technology with a Ph D in Bioprocess & Food Engineering. I am NET qualified. I have worked at BFIT and Doon PG College as Assistant Professor. I joined Uttaranchal University in 2018 and have been working as an Assistant Professor here."